From 1967 until 1973 NASA employed the services of Raymond Loewy, a legendary figure in the design world. Loewy's firm produced over 3,000 designs for NASA during this time. And everything they produced for the space agency would fit perfectly in Stanley Kubrick's 2001: A Space Odyssey — like the Loewy space taxi pictured above. Loewy is best known for his work designing earthbound objects, from trains to the iconic Coke bottle to the livery that still decorates Air Force One. But during those six years, the employees at Loewy's design firm served as "habitability consultants" to NASA with the hope of making projects like America's first space station Skylab (in orbit from 1973-1979) more human-friendly. Not all of their ideas were terribly practical, but they helped define the space design agenda for decades to come. Below, we see one of Loewy's full-scale mock-ups for an "artificial-G, shuttle-compatible space station interior" courtesy of NASA. "Prior to Skylab, NASA designed its vehicles like aircraft cockpits, where providing basic life support was the guiding principle," the new book Milestones of Space edited by Michael J. Neufeld explains. "Engineers at the NASA Marshall Center in Hunstville, Alabama, saw no need for amenities; instead, they stressed functionality and reliability." But people like NASA's George Mueller and the contractor Martin Marietta (who were actually responsible for bringing Loewy into the fold) understood that if regular humans who weren't fighter pilots and astronauts were to ever go into space, things would have to be designed a bit more posh. 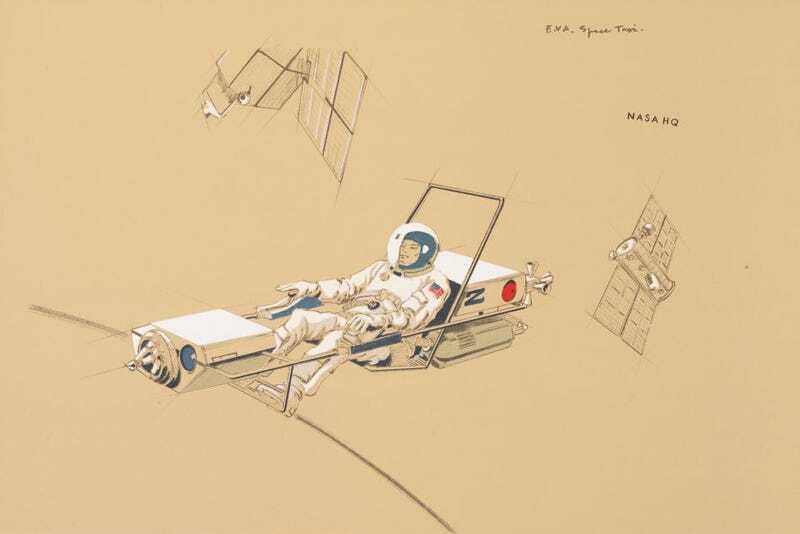 The stated goal of bringing on Loewy was to "help insure the psycho-physiology, safety and comfort of the astronauts." And even though some of the designs were too wild for the time (many of them having to do with space constraints and practicalities) they helped NASA consider new ways to make humans more comfortable in the cold, alienating confines of space vehicles. If you're a fan, you can read Loewy's 1973 report [pdf] to NASA on designs for space shuttles and stations. The images and ideas evoke the space age futurism of the late 1960s and 70s perhaps better than any other official report produced for NASA. Loewy's work helped bridge the gap between science fiction and science fact, bringing a mod-sensibility to the agency. This marked an official recognition by NASA, of the fact that spacecraft architecture and design can significantly influence crew health and behavior. Assisted by a substantial design team, Loewy devised means of promoting both sociability and privacy among astronauts on Skylab missions, argued for the inclusion of a viewing porthole, and suggested ways of handling nutrition, hygiene and elimination in weightlessness. This allowed the astronauts to have a view of earth while in space and grant physiological support. Loewy also installed a triangular table in the Skylab wardroom, so that, as he put it, 'no man from the three-person crew could be at its head.' He felt that in a three-man crew it was vital that no man, however unconsciously, should dominate the others.The Skylab wardroom table is not only demonstrative of the Loewy's concerns for 'habitability', but also of its 'psychological' and 'social' implications for the crew that design brings. Loewy and his team, supported by Muller, put the spotlight on the fact that 'Habitat Design Matters'. Due their efforts, not only did habitability make its way in to the NASA human spaceflight vocabulary, but also psychology, architecture, industrial design, and human factors. Loewy was certainly best known for his designs for Coca-Cola, Studebaker, and Shell but he should also be remembered for his tremendous contributions to NASA. If only for giving us a peek at the glorious space-bound future that never was — even if they weren't really appreciated in his lifetime. "Loewy's contributions to the space program were eventually acknowledged by many at NASA, and he further tightened his bond with the agency when he served as the habitability consultant for the Space Shuttle and the International Space Station," explains the book Milestones of Space. "He not only laid a foundation for the future design of space stations, he envisioned an approaching reality when men and women could comfortably live and work in the vacuum of space."